Generous Gin has been bottled in France, it is tender and aromatic. Generous Gin is a tender gin, aromatic with floral notes, fruity and spicy. This gin has been bottled in France. The design of this bottle refers to a cocktail shaker, a nice white color with prints of flowers. The famous Ginger Ale, a sparkling ginger-flavoured, non-alcoholic drink. It is very used for cocktails. Sweet and malty, this drink is very balanced by the mixture of ginger and the freshness of the lemon. The Lemon Tonic is the essential drink to succeed the best cocktails! Tonic is a soda that mixes perfectly with spirits to make fine and subtle cocktails thanks to its slightly bitter and very typical taste. 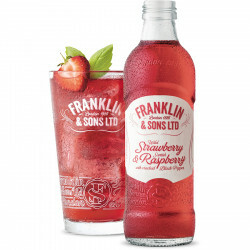 Strawberry and sparkling raspberry juice, to taste fresh for better flavours. Sparkling drink with apple juice, rhubarb and a hint of cinnamon. Sparkling drink with Sicilian lemons & elderberry flowers. 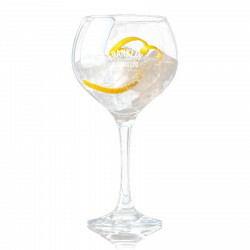 Serve your own cocktails in this gin glass from the Franklin & Sons' brand of soft drinks. Nose: nice citruses notes, floral and spicy. Palate: tender, spicy with a light finish.